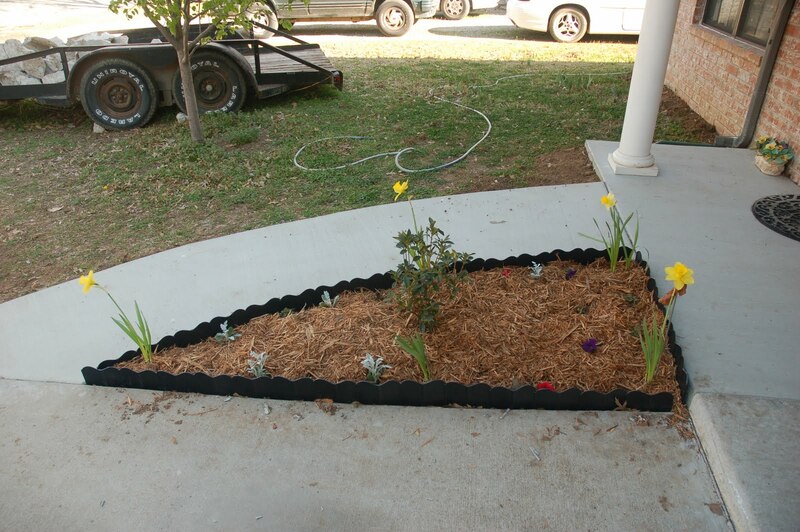 Well, I finished up the flower bed last night. 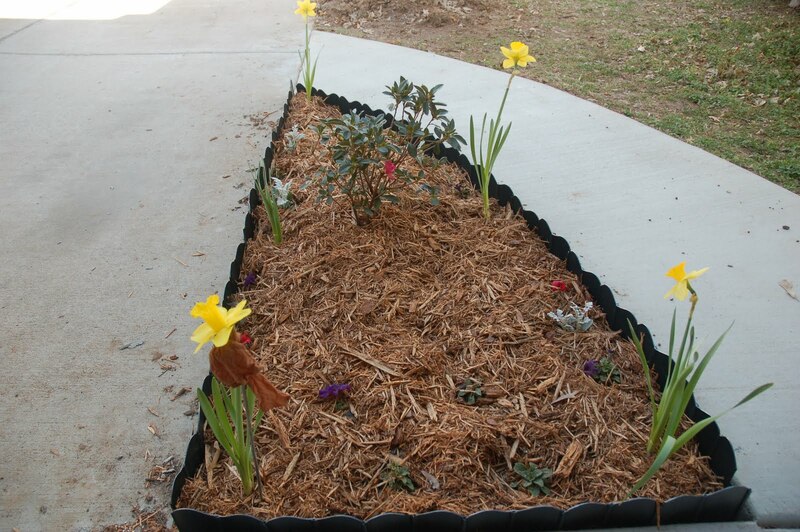 I added a border and mulch and this is the end result. Took the pic from my perspective and from the side. Once we got the sidewalk in and it was ready, I could not WAIT to get some flowers in. We(I) planted an azalea, petunias, Dusty Miller, and Daffies. Whatcha think? 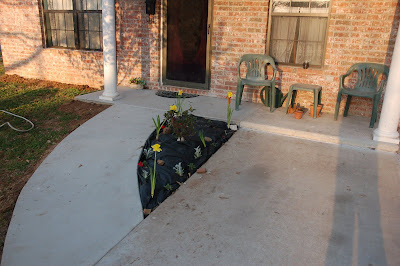 So, last year, because I was clueless and did not water the foundation, the porch cracked, broke and fell off. The porch post was dangling so we HAD to fix it. They have been working on it since last Wednesday and I forgot to take pics as they went. But it looks awesome! Ok, so it will look more awesome when the caution tape is gone and the old porch is gone and dirt is redistributed, but hey! it still looks great! Well, it has been a while since I posted and a LOT has happened. I won't go into details, but Jessa is no longer with me in Okmulgee, she is now with her sister in AR. I am sure she is being taken good care of. On Wednesday night/Thursday morning I got a phone call at 12:30 a.m. Joe, my brother Danny's roommate, called to tell me Danny was having another heart attack and that the ambulance was on the way. Let me preface the rest of this story by saying I would not take my worst enemy to Okmulgee Memorial Hospital if they were on their deathbed. It is a joke of a hospital and that is really sad to say as it is the ONLY hospital in Okmulgee. So...if you call an ambulance in Okmulgee, you naturally go to Okmulgee Memorial. When I heard the ambulance was on its way to pick up Danny, I said a prayer that OMH would suddenly be competent. Not so much. I got to the hospital as they were taking Danny out of the ambulance at about 1:05. At 2:30 a.m., my brother, while having a major heart attack, got up and walked out to my car for me to take him to the NEXT closest, and much better, hospital in Henryetta which is 13 miles away. He was in my back seat crying and screaming the whole way. To say that I was scared is putting it mildly. Okmulgee had only given him anti-anxiety meds and did not even hook him up to an EKG! I flew to Henryetta with Danny in the back seat and we walked in and I said "heart attack" and they IMMEDIATELY got him to the back, hooked up to an ekg, blood drawn and chopper on its way in FIVE minutes. Total time Danny was at Henryetta?? Approximately 40 minutes. In that time, they did his EKG, drew his blood, attempted to get his blood work results from Okmulgee (Okmulgee STILL had not sent them when we left Henryetta) and had him packaged up to be Life Flighted to Hillcrest (Oklahoma Heart Institute) in Tulsa. What the HELL was up with Okmulgee??? They almost killed Danny because of their incompetence. By the time I drove back home to tell Dad what was up and to get a couple things to take with me to the hospital in Tulsa and finally got to Tulsa, Danny was in the Cath Lab and Dr. Leimbach was placing another stint. At about 7:00 a.m., he came out and said that Danny had two 100% occlusions, one of which was growing feeders around it to naturally bypass it. He placed a stint in the other one. No clue at that time if Danny would have permanent heart damage or not. It is now 4 days later, or is it 3? and we were told today that so long as Danny remains sedentary for the next two months (I thought they said weeks, but Danny said they told HIM two MONTHS), he should have NO PERMANENT DAMAGE. Praise God! Your prayers worked! Thank you so very much! Today I had the pleasure of taking Danny home from the hospital and making sure he got in bed. He is exhausted, but glad that God spared him. I am exhausted. This week has been a long month and this month has been a long year. Thank you all for your prayers. You will never know just how much they have meant to me and my siblings. Bless each and every one of you!